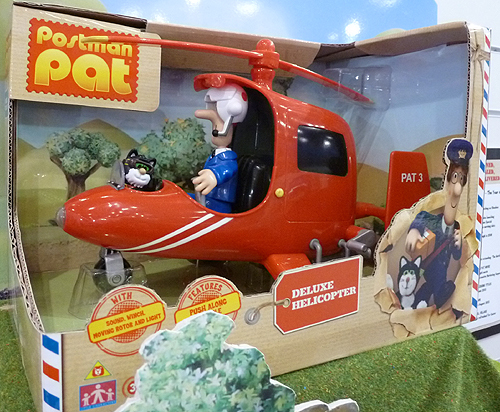 Pat 3 is Postman Pat’s smart new SDS Helicopter. The SDS Helicopter is made by Character Options, was first released in 2010 and is found in two versions. The standard SDS Helicopter includes the cow and sling (but NO Pat and Jess figures). The Deluxe SDS Electronic Helicopter is in a much larger scale and includes Pat and Jess figures, has a windable winch, friction power wheels that also turn the rotors, plus a light at the front which comes on when the helicopter is pushed. The standard Pat 3 Helicopter has moveable rotors and wheels. It has seats for Pat and Jess (not included) and includes a harness and highland cow accessories. Both SDS Pat 3 Helicopter, like the other vehicles in the Postman Pat SDS range, have push button sound effects including the SDS musical theme tune.